No one tells you about how awful “the terrible twos” really are. More on that later. Current stats: about 34 inches long; more than 25 pounds. 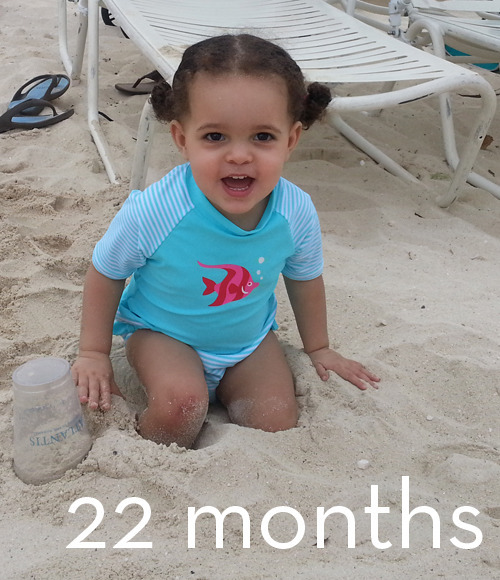 These numbers will get updated after her two-year checkup in May. New words: princess, (silly) goose, some, have, want, wheels, bus, around, make, soup, bucket, how about, how are ya, rabbit, white, yellow and Parker. Mama and Dada have become Mommy and Daddy. We survived Parker’s first ear infection in January. It was a horrible three weeks. She had a terrible cold complete with a nasty cough. All she did was scream and say “NO!”. She wouldn’t eat or drink for almost 3 days and she started losing weight. It was the first time I ever questioned our decision to become parents. We live in the future, right? I wish babies came with maintenance warning lights, like cars. She never touched her ear so we had no way of knowing that’s what it was. After several days of fever, a pediatric nurse called it after witnessing her cough. With the help of a 10-day course of antibiotics she was back to her usually sweet self. That said, her meltdowns these days are pretty epic. I’m completely disarmed by them and feel helpless. I think of myself as a smart person who can usually find an answer to a problem but a stubborn 22-month old is a mystery to me. Everyone (family, friends, the Internet) has an opinion about how best to deal with this: ignore them, time outs (for older kids), spankings, extra love, withdraw emotion, let them cry it out, distraction, giving in to their demands … it all seems inadequate. I know I’m the adult and the one in charge but parenting a toddler it is physically and emotionally exhausting. We’re living with a bi-polar dictator and, while I can’t speak for Andy, I feel pretty stupid when it comes to what to do about it. I wish the Baby Whisperer was still alive to guide me. To echo the title of a book I’ve added to my list, modern parenting is all joy and no fun. I know that sounds whiny and very first-world-problem-y but I’m really at a loss. I know you’re wondering what sets her off. Every single tantrum results from one simple thing: not getting what she wants. An article I read said, “For children between 1 and 2, tantrums often stem from trying to communicate a need – more milk, a diaper change, that toy over there – but not having the language skills to do it.” Great, right? Fundamentally, she needs to learn that she is not in charge; we are. Don’t get me wrong. We give her plenty of independence and lots of opportunities to control her environment. I know The Biscuit is too young to have the coping skills to deal with being small in a big world. I’ll have to add teaching her how to accept the things she can’t change to my mom list that also includes language, manners, safety, creativity, love, curiosity and EVERYTHING ELSE she needs to know to be a good person. Hopefully the next couple of years will fly by. I hear kids are much easier to deal with after they come through this phase, somewhere around 4 years old. I bought a potty, just to have around as furniture, so she can used to seeing it. Initially, she was using it as a chair. Then she started picking it up and carrying it around. I bought a potty board book that she likes to read while she’s sitting on it. So far, we’ve only gotten her to put a tiny bit of pee in the potty but it’s coming along. Since the last post she’s traveled to Saratoga for a 4-day visit with Grandma Lulu (Andy and I went to Miami), we went to Atlanta in January for Gram’s surprise 80th birthday party, and to The Bahamas this month to celebrate Andy’s 35th and escape the Boston winter. We’re talking about 2014 trips to NYC, Denver and New Orleans. If you want us to come visit you, you should say so.